Our top quality shop maintains a staff of experienced technicians. The key to your vehicle’s enhanced performance and longevity is our preventative maintenance. This is how our customers avoid costly auto repairs, with an effective service plan. It’s possible to prevent performance issues and malfunctions. All we need is your description and your vehicle. Croce’s Transmission in Norwalk, CT has been providing top-notch auto repairs and services to the Norwalk area since 1999. That’s how our relationships with our customers start, as a partnership designed to keep you moving. We provide a variety of maintenance services to keep your vehicle in optimal condition, including oil changes, tune-ups, fluid services, maintenance inspections, diagnostic services, and more. Preventative maintenance is the key to your vehicle’s longevity and how you can retain its resale value. Should your vehicle require auto repairs, we’ll provide accurate testing and a diagnosis first! Most customers know us by our expertise in all transmission services. We want all Norwalk motorists to know that we also provide general auto repairs for all makes and models of vehicles. Every repair will begin with a quick but thorough diagnostic service. Finding out the truth every time is the greatest benefit to your visit. Croce’s Transmission will never perform unnecessary auto repairs or waste your time with a misdiagnosis. Whether you need a transmission service, flush, rebuild, repair or a replacement, your vehicle is in the best hands. 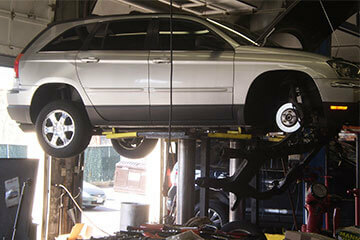 We discourage our customers from trying to diagnose their vehicle’s problems, especially the transmission. Transmissions are notorious for being misdiagnosed. For all other general auto repairs, we use the industry’s most advanced testing equipment. We stand by our quality repair services with a competitive service guarantee. Schedule Your Auto Repair With Us! Let our team show you the highest standard of quality auto repairs and maintenance. We go above and beyond to make sure your vehicle stays road-ready. Pay attention to your vehicle’s systems–engine, mechanical, and electrical–and bring us any performance issues that you need corrected. Stop by our facility and we’ll design a service plan that’s perfectly suited for your vehicle and your driving habits. Our general repair and transmission services will extend your vehicle’s road-life and enhance its overall performance. We use the best quality replacement parts and are equipped with state-of-the-art tools and service techniques. Give us a call today at 203-845-8899 to schedule your auto repair appointment. You can save time by scheduling right now using our convenient online scheduling system. Next time your in the area–301 Main Avenue–feel free to stop by with any questions or concerns.